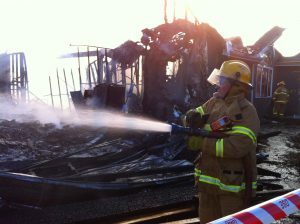 Thank you for thinking about about supporting Gisborne CFA. CFA is one of the world’s largest volunteer-based emergency management organisations. The team comprises more than 59,000 volunteers, supported by over 400 career fire fighters and officers and more than 700 career support and administrative staff. Situated in Victoria, CFA covers an area of more than 150,182 square kilometres of land covering 2.5 million people. This area includes more than 980,000 homes, and covers all of rural and regional Victoria, including provincial cities and towns (except State forests and National Parks). The area also includes more than one million residents in outer Melbourne suburbs such as Frankston and Dandenong, and key growth suburbs such as Cranbourne, Melton and Werribee. CFA brigades respond to a range of different incidents and CFA broader activities include community education and fire investigation. Gisborne brigade is responsible for Gisborne and South Gisborne, and supports the surrounding brigades of Sunbury, Riddells Creek, Macedon, Mount Macedon, Bullengarook, Coimada and Toolern Vale. We are also regularly formed into local, state and national strike teams, with volunteers spending up to four days away at a time. The ties between CFA, state government, local government, industry and brigades are essential to the successful operation of CFA. As a community service organisation, Gisborne CFA brigade is strongly supported by our local community in responding to meet Gisborne’s fire safety and emergency management needs. During these exceptional times the most effective way for you to support Gisborne CFA is by donating directly through paypal. You’ll find the button at the bottom of each page allowing you to donate using your credit card direct to the brigade. We can also accept cheques, cash and direct bank deposits – please contact us via the contact form. Your money goes directly towards the purchase of equipment to help the brigade.